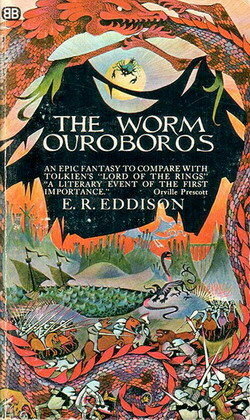 The Worm Ouroboros is a heroic high fantasy novel by Eric Rücker Eddison, first published in 1922. The book describes the protracted war between the domineering King Gorice of Witchland and the Lords of Demonland in an imaginary world that appears mainly medieval and partly reminiscent of Norse sagas. The work is slightly related to Eddison's later Zimiamvian Trilogy, and collectively they are sometimes referred to as the Zimiamvian series.